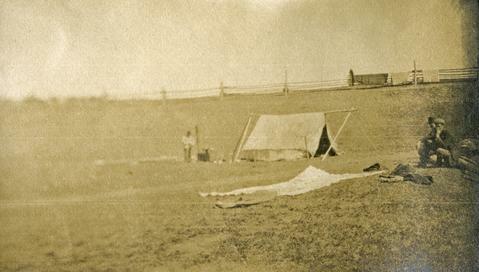 Photograph depicts a tarp spread out on the grass, two men sit nearby the tarp. There is a canvas tent in the background with a man standing beside it. Behind the tent is a low hill with a fence bordering the top of the hill. There are blankets drying on the fence.